I’m starting this post off like I start each morning off by saying “ONLY GOD”! When I think of the goodness of God and all that he has done for me, continues to do for me and all that he has planned for me, I get so emotional with thanks and praise for him. When I received the “ONLY GOD” tee from Nichole, the owner of InFaith Teez, I had to do my “happy dance”. I love being able to express my love for God and all that he has done for me, all that he has brought me and continue to bring me through and I’m not ashamed to let anyone know my love for Jesus….being able to express how I feel from the inside hopefully comes through on the outside and yes, I love that I get to express it with this cute ONLY GOD Tee…I love it and the fabric of the Tee is AMAZING…so amazing that I’m wearing it with my eyelash skirt from Banana Republic and classic pink coat….how cute is this look for church, brunch with the girls and date night! Of course, this would be the perfect match for a pair of jeans as well! 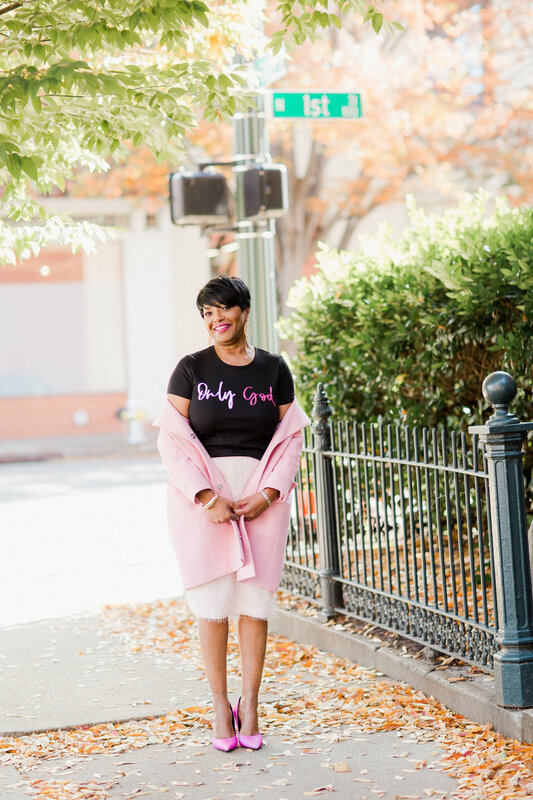 So hurry over to InFaith Teez and check out all the beautiful and inspirational apparel and accessories and it’s the perfect time to place your orders for holidays….such beautiful gifts and of course you need to order a few things for yourself! Use code: medleyfaith and get 20% off your order!